Big Monkey commented about the "ice cream" police trying to catch me, but the reward wasn't high enough for him. Well, I just happened to take a picture of that "poster." As the title says, I visited my radiation oncologist yesterday. He's a very,very smart man (not that my other doctors aren't), and he always seems to calm me down and give me more hope. Note that I said "more" hope, as I'm still hoping to defeat this terrible disease! His plan is to check my tumor via MRI in a month to see what it does - shrink, grow, whatever. In the meantime, I will contact him immediately if I experience ANY physical changes (I think most likely with my walking, which is already not "normal". If I do have any changes, I assume that he would radiate my spine as soon as he could. In the meantime, I will continue receiving Avastin every two weeks. Posted 1/27. Laura and I ate dinner (~7:15PM start) at Jason's Deli again after leaving Moffitt. It has been a while since we ate there, although we still really like it for their healthier choices, and free stuff. For instance, I really like their free cornmeal mini-muffins and free ice cream. 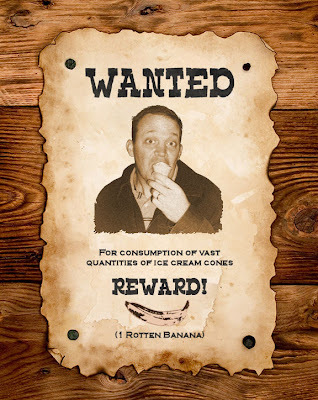 They may have healthy choices on the menu, but I guess I destroy that by eating too many free ice cream cones. They are small, though. A tragedy occurred when I dropped half of my second 'cone on the floor! It landed ice cream-down, but I wouldn't have eaten it no matter how it ended-up on the floor (maybe). Posted 1/27. Laura and I spent most of the day a Moffitt yesterday, left the house at 9:45AM and got home around 9:15PM. Of course, that includes about 2 hours of commute time and a "lite" dinner that was around 45 minutes long. 11 1/2 - 2 - 3/4 = 8 3/4. Just 8 hours and 45 minutes at Moffitt... Not bad, considering the appointments I had. 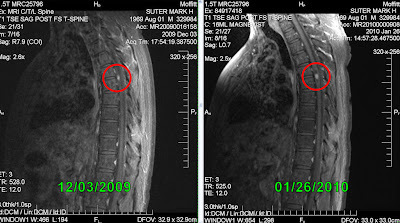 The MRI below shows that my spinal tumor has grown since the last MRI (12/03/09). It had been slowly shrinking due to Avastin, but it appears Avastin may have "worn out its welcome." Seriously, it is likely (according to my doctors) that Avastin is less effective now because my tumor may have changed its biology (structure). Half-jokingly, the tumor must have a "brain" with enough intelligence to defeat Avastin. 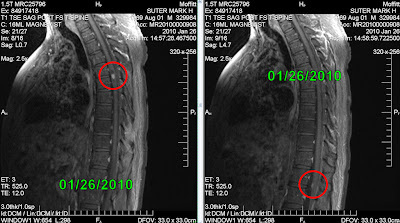 I also likely have a new tumor on my spine, as shown below. It is lower than my current one, which is also shown again for reference. Note, these are two MRI images, as one image does not capture both... Apparently, the new one "is just around the corner" from my existing one. I received another dose of Avastin after my doctors went over my MRIs. It was again uneventful, and done so fast (I fell asleep) that we forgot to take a picture. So, we took one on the way out of the Infusion Center (that's the department that administers most of my chemo). A couple of things. First, apparently once somebody is "on" Avastin, they cannot stop taking it, for fear of a major outbreak (tumors everywhere). I did not know that prior to yesterday, and I don't like it! Second, although I did enjoy the time from October through now (almost 4 months), if I could go back, I would try to do more (not that I didn't do anything)... This comment is not meant to be interpreted negatively, but you never know what will happen next, and that applies to everyone... You should enjoy every day to its fullest! Thousands of fish died because they couldn't handle the low water temps, which dipped into the low 50s and high 40s. I just went out on the 21st to take some pictures, but a lot of the dead fish had either been eaten by other animals, decomposed, washed out into deeper waters, or were cleaned-up by people. Since I was late (due to my own hibernation), there weren't many to be found. 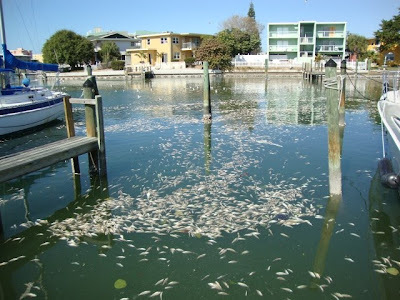 I looked at Crystal Beach, at a canal near my father's mobile home (a lot of canals and inlets dead-end around here, so many dead fish washed into these areas), and at a waterfront restaurant that Laura and I went to last night (1/23). As much as I wanted to stick to my own photos, I looked at a local newspaper's web site, and downloaded a few. They have the advantage of starting earlier and covering more ground than me... :-) So, the following photo is from their site, it shows MANY fish floating on the water, and is meant to shock readers! A lot of local plants suffered, as my photo below demonstrates. 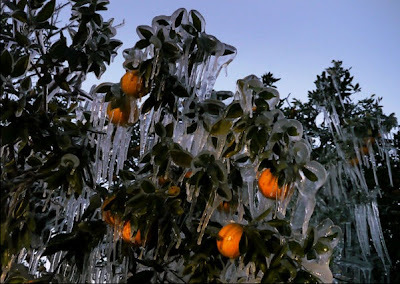 It also affected a lot of crops, as shown in the St. Pete Times photos below. 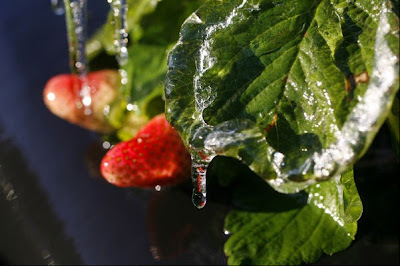 Local farmers spray some of their crops with water, and the ice that forms protects them from cold temps (likely any temps lower than 32 degrees F).